Here we are at day three of my celebrations posts. Tomorrow we will celebrate the life of someone very special and then starting on Monday, I promise to share some Christmas cards with you. 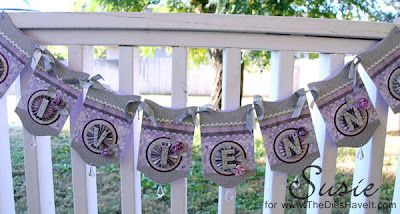 But first, here is today's banner. I was so excited to be able to make this banner for a friend of mine who was hosting a baby shower. I don't get to do too many girly girl projects, so I jumped at the chance to do this one. 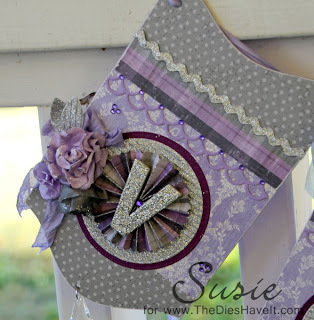 I just love the grey, lavender and silver on this banner! I saw the party pictures on Facebook, so I know how pretty the banner looked with all the other beautiful decorations and that just makes me happy! See you tomorrow with one more celebration.